The Kyrgyz foreign ministry has notified the US ambassador in Kyrgyzstan it is going to shut down the US Manas air base in July 2014, media say. Kyrgyz foreign policy chief Erlan Abdyldayev today handed a notification to US ambassador in Kyrgyzstan, Pamela Spratlen, saying the lease of the air base runs out on July 14 of the next year. A spokesperson with the Kyrgyz foreign office told the media Bishkek meant to warn Washington about its decision to pull out of the deal six months prior to denouncing the contract, as it was stipulated in the agreement on the Manas lease. The Manas air base was opened in December 2001 and initially housed forces of several NATO allies involved in anti-terror missions in the region. 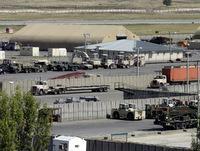 As time passed, the contingent melted down to US troops, who used the base as a transit center for their Afghan operations codenamed Enduring Freedom.